Winner of the Man Booker Prize 2012 Winner of the 2012 Costa Book of the Year Shortlisted for the 2013 Women’s Prize for Fiction ‘Simply exceptional…I envy anyone who hasn’t yet read it’ Daily Mail ‘A gripping story of tumbling fury and terror’ Independent on Sunday Winner of the Man Booker Prize 2012. Continuing what began in the Man Booker Prize-winning WOLF HALL, we return to the court of Henry VIII. The volatile Anne Boleyn is now Queen, her career seemingly entwined with that of Cromwell. The split from the Catholic Church has left England dangerously isolated, and Anne has failed to give the king an heir. And when the King begins to fall in love with self-effacing Jane Seymour, the ever-pragmatic Cromwell must negotiate within an increasingly perilous court to satisfy Henry, defend the nation and, above all, to secure his own rise in the world. Neither minister nor king will emerge unscathed from the bloody theatre of Anne’s final days. An astounding literary accomplishment, BRING UP THE BODIES is the story of this most terrifying moment of history, by one of our greatest living novelists. Just as good ad Wolf Hall, with beautiful writing, a superb sense of space and time and a sensitive penetration of Thomas Cromwell's complex personality. Equally penetrating is her insight into both Henry VIII and Anne Boleyn. Read Wolf Hall first and then try and be patient until Hilary Mantel completes the third book. Pure pleasure. I found BUTB quite a shift after Wolf Hall. The cast of characters was almost insurmountable but, persistence overcome!!! It became more and more difficult to 'put down'. Understandably one doesn't get the opportunity to become too familiar with each character, and indeed, it was difficult at times to determine what was to be attributed to Thomas Cromwell. Not a read for the prudish!!! BUT come to terms with this aspect and you can be promised an enjoyable read and certainly a challenge to any preconceived ideas one might have about English history. Thank you Hilary, and get the ball rolling again for more of the same! B. Brilliant follow up to Wolf Hall. Couldn't put it down. If you are a fan of Tudor England these two books must not be missed. 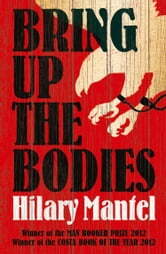 The writing is highly evocative - you can see Henry VIII & his court through Hilary Mantel's writing. If only there were more to follow! As powerful and compelling as its title. You know the Henry VIII/Anne Boleyn saga. This time it's relayed through another protagonist. Thomas Cromwell, complex and ruthless, rose from tradesman and mercenary to become the king's supporter and confidant, Master Secretary and eventually Lord Chancellor. He used his enormous influence with skill and subtlety, helping free Henry to wed the bold Anne Boleyn. This book follows their brief marriage to its conclusion, giving a deep picture of the life and times in Henry's England. Marvellous. You might like to read "Wolf Hall" first, since it introduces Cromwell, his life and career.